I need to generate a PNG file of an image composed in LibreOffice Draw. When I export to PNG directly, the quality is almost perfect, but it's just slightly blurry. However, when I export directly to a PDF with lossless compression, the quality is perfect --- just not in PNG format. The dimensions of the image are 495x304. Whenever I try to convert the "perfect" PDF file to a high-quality PNG file, the PNG file at 100% magnification (as viewed in evince) is about 2-3 times larger than the image in the PDF file. Or, when I get the PDF converted to PNG at approximately the correct dimensions, the PNG file is too sharp. 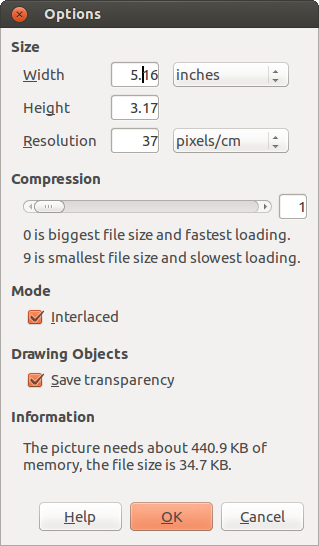 But neither command renders a PNG with quality as good as the PNG that can be directly exported to in LibreOffice Draw. So, my question is how to do either of the following: (1) export to better quality PNG directly from LibreOffice Draw; or (2) convert the perfect quality PDF to PNG with comparable quality and same dimensions. There is something off about the Export tool of LibreOffice in general. It has been years, and it is sill broken. An alternative is just taking screen shot, but obviously you cannot control de resolution. Is so simple, i hope this helps someone. Not the answer you're looking for? Browse other questions tagged images pdf png libreoffice or ask your own question. Export from Libreoffice Draw to PDF with autocrop?